WATERFORD — Voters on Saturday approved a fireworks ordinance that would allow use without a permit around the Fourth of July holiday. Resident Charlie Tarbell said at the annual town meeting that he represented a small group of citizens that got together in the fall of 2017 to develop a fireworks ordinance. Some townspeople were concerned about how inclement weather would affect the ordinance. One resident said that the way the ordinance is written, if it were to rain on July 4, people would have to apply for permits if they wished to postpone celebration until July 5. Tarbell said the ordinance was written the way it was because “according to state law,” if inclement weather cancels July 4 celebrations, it is postponed until the following week. Voters also approved a $1.85 million municipal budget that is $344,964, or 8.1 percent, more than last year. Most of the increase comes in the paving budget: $616,778 for 2018 compared to $316,778 in 2017. That’s because $196,778 of that increase was raised last year for improvements to Mill Hill Road but wasn’t spent. A significant rainstorm washed away part of Blackguard Road and officials were not sure how much that repair would cost. The $196,778 was rolled over to the 2018 budget, according to the town report. 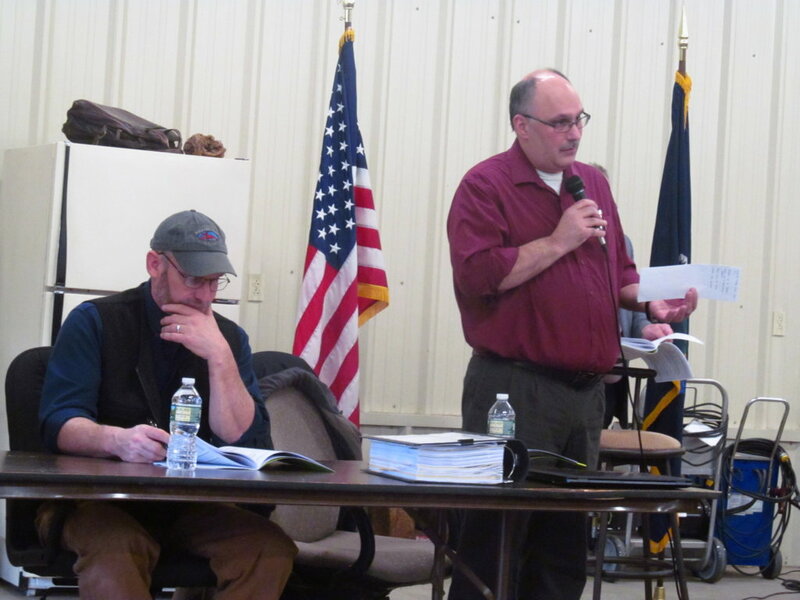 Chairman Randy Lessard, right, explains to townspeople Saturday morning at Waterford’s annual town meeting why the town’s proposed municipal budget increased by 8.1 percent. Selectman John Bell listens.